Posted May 8, 2013 by davezumbekphoto & filed under Wedding Photography. 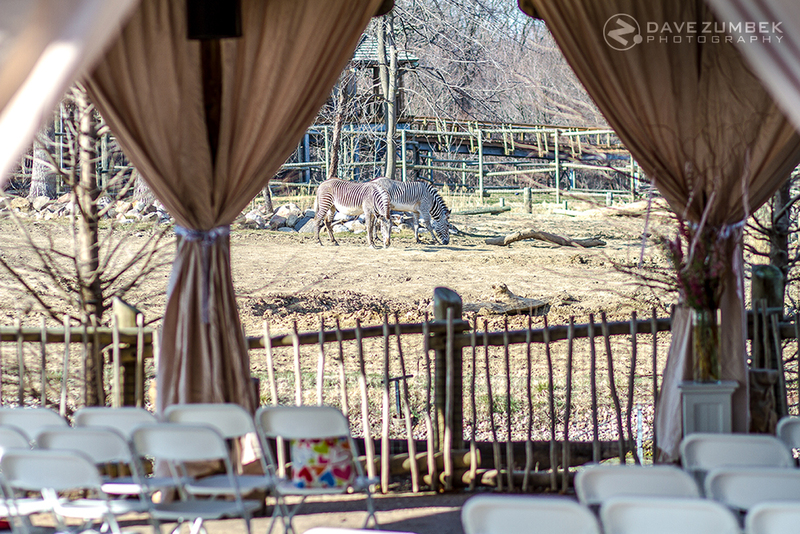 Recently I had the opportunity to shoot a wedding at the Glen Oak Zoo in Peoria, IL. This was a first for me and something I never thought I would do in my photography career. The words “zoo” and “wedding” aren’t necessarily words that I would have associated together before being hired for this event. I was a bit apprehensive at first, not knowing what to expect. However, the day turned out great, resulting in wonderful memories for everyone. Some of you non-Peorians may not have realized that Peoria even has a zoo. I was definitely in that boat. As a Chicago native, I am used to the likes of Brookfield Zoo, one of the largest in the country. My first visit to the Peoria Zoo was in the fall of 2012, and from what I briefly saw, I was surprised at how large and nice it was. Even with my prior visit, I didn’t know what was in store for me that day. I couldn’t help but wonder, would the bride be carried into the ceremony via elephant back? Would the bride and groom mount roaring lions and take off down the aisle following the introduction as husband and wife? My questions were both ridiculous and un-realistic. Still, I knew the opportunity was there to capture some very non-traditional wedding shots. Zebras graze in the background before the wedding ceremony takes place. Both the wedding ceremony and the reception took place in the Africa Exhibit. This was an interesting contrast to the normal Illinois landscape. It was a beautiful day and the local wildlife grazed gracefully. The guests had the opportunity to view zebras, rhinos, lions, and probably more that I didn’t have time to see. There was time leading up to the ceremony and time before the reception where the guests could walk around and view all the animals that were out and about. This was quite a pleasant contrast to most the weddings I have been to or photographed. Usually you are stuck at a cocktail hour, anticipating the wedding party’s arrival. In some cases, you are left to fend for yourself for roughly 2 hours while pictures are being taken. Not at this wedding. Everyone in attendance had the opportunity to walk around and witness wonders of nature that normally aren’t possible in our part of the world. This really presented the opportunity to capture some very unique wedding moments. 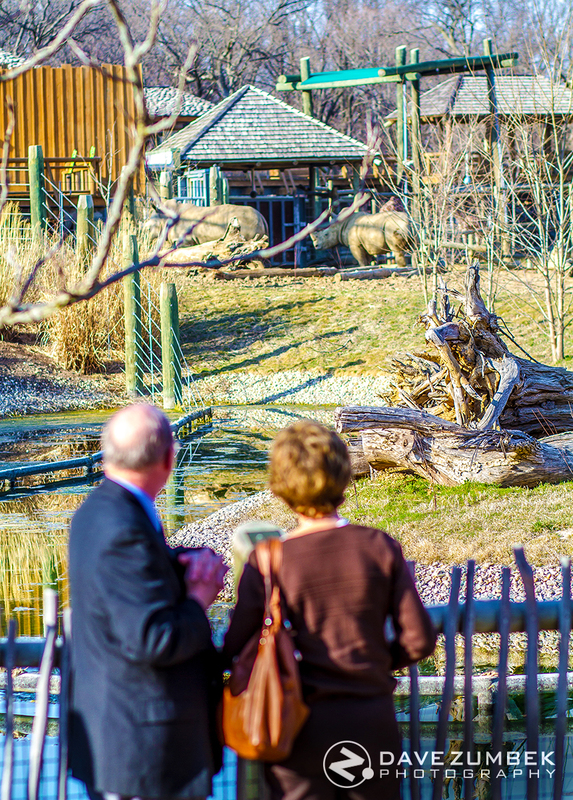 Guests enjoying the rhinos before the ceremony started. From what I could tell, the guests really enjoyed the ceremony, reception, and everything in between. I could also tell that the Bride and Groom had a wonderful day. The weather was gorgeous, with sunny blue skies and warm weather for spring in Illinois. It was truly a perfect day. I was able to capture some great memories for them they they will be able to cherish for a lifetime. This wedding was truly a unique experience, and although maybe a little skeptical at first, I was highly impressed with how the day’s events unfolded. 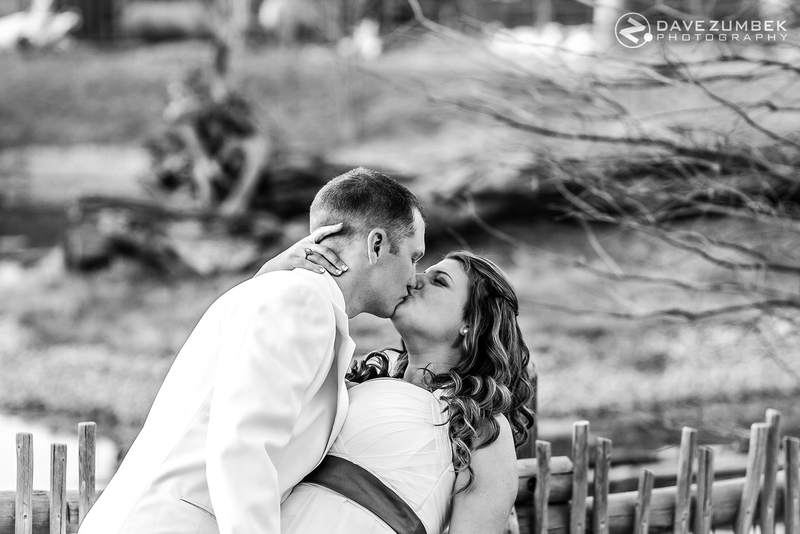 The Bride and Groom share a post-ceremony kiss at the Peoria Zoo. To see more pictures from the ceremony, check them out as I complete editing here.